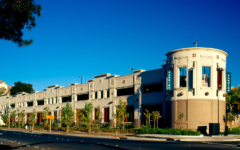 This parking structure adds pizzazz, ambiance and color to the Todos Santos Plaza and the revitalization of downtown Concord. 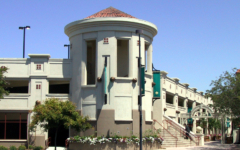 The architectural concept provides continuity of design with the neighboring buildings, including a historic 1911 stone-stucco Foskett & Elworthy Building. 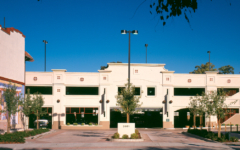 A unique feature of the parking structure, adding to its pedestrian-friendly atmosphere, is its location alongside the Paseo, a pedestrian walkway that runs through downtown. 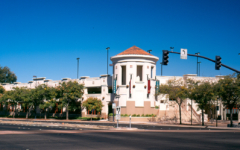 In response to the Paseo’s arched gateways and lush landscape, as well as the city’s Streetscape Design Guidelines, vehicle access drives are planted to offer pleasant and inviting entry points. A 363 SF management office is also included.